There aren’t quite as many loan programs as there are borrowers, but it seems like it sometimes. We’ll work with you to qualify you for the best loan program to fit your needs. Here are a couple of things to consider when refinancing. Lower Your Rate and Monthly Payments? Yes of course who doesn’t what a lower payment and rate. Give us a call or apply and if the market is lower than what you have now then refinancing might be the best option. Maybe you currently have a fixed-rate mortgage with a higher rate, or maybe you have an adjustable rate mortgage (ARM) where the interest rate varies. When you qualify for a new fixed-rate mortgage, you lock in that low rate for the life of your loan. If you plan on staying in your home for the long haul this is a smart move. If you are planning on skipping town or on the lamb then an ARM with a low initial rate might be the best way to lower your monthly payment. Cash Out Some Home Equity? You can use your home’s equity to get cash now, so you could fix your house up or go to Vegas. To do this, you’ll need to qualify for a loan for more than the balance remaining on your current mortgage. If you’ve had your current mortgage for a number of years and/or if you have a mortgage whose interest rate is higher, you may be able to do this without increasing your monthly payment. Cash Out Some Equity To Consolidate Other Debt? If you have the equity in your home to pay off other debts with higher interest rates than the interest rate on your mortgage — for example, credit cards, home equity loans, car loans, some student loans — means you can save possibly hundreds even thousands a month. What’s even more impressive is that you can often deduct the interest you pay on these loans on your income taxes, something you can’t do with credit cards, but definitely check with your tax dude. Consider refinancing with a shorter-term loan, such as a 15-year mortgage. 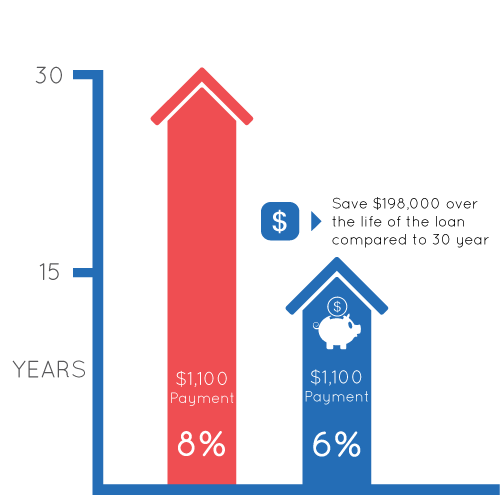 So your payments will be higher than with a longer-term loan, but in exchange, you will pay substantially less interest over the life of the loan and payoff your house so you can get to chillin quicker. If you have had your current 30-year mortgage for a number of years and the loan balance is relatively low, you may be able to do this without increasing your monthly payment — you may even be able to save. $150,000 30-year mortgage at 8%. This is a great option for people whose main goal is not to save money on their monthly payment but rather to build up equity and pay off their home more quickly.